Jackie Knechtel talks about “How to Embrace Effortless Flow in Life and Business” in this episode of the Intuitive Leadership Mastery Podcast with host Michaela Light. How else could this happen? How her intuition told her to turn down a $10 million in fund to building an autism clinic that she had worked on for 6 years. Master of living in flow, master manifestor and super connection. Recovered perfectionist and people pleaser. Jackie Knechtel is a pioneer in the area of Flow Consciousness. She guides mission-driven entrepreneurs to effortlessly create exponential success in life and business and awaken them to their limitless potential. She is the co-founder of the Flow Consciousness Institute and leads retreats, workshops and delivers transformational experiences worldwide. Jackie is also the co-author of the forthcoming book Flow: The Art of Effortless Living and is actively shifting consciousness on a global scale through her speaking, coaching practice and by blending science and spirituality into practical tools for living an enlightened life. Michaela: Welcome back to the show. I'm here with Jackie Knechtel, and we're gonna talk about how she embraces effortless flow in her life, and business. And she'll show you how to do that. She built a business without following that normal formula that they tell you in business books, and made it successful. And she also knows how to fit in when you might stand out. And how she turned down a 10 million dollar funding deal to get something bad because her intuition told her to do so. We’ll also look at how she found a business partner. Is quiet a story there that's very spontaneous, and her intuition just guided in that. And we’ll also look at how she lives effortlessly, and how you can too. So welcome Jackie. Jackie: Thanks so much for having me. Michaela: You’re so welcome. And if you don't know Jackie, she is a master of living in the flow. I bumped into her in Lisbon, and we connected there at a conference. Didn't know her before, and here we are talking on the show. She is a master manifester, super connector, and she also confided to me that she's a recovered perfectionist, and recovered people pleaser. So maybe I we’ll sneak in a little talk about what that means later. But let's talk about how you've been… You've built your business with a business partner. And we'll talk about how you met that business partner in a moment. But you haven't followed the traditional route for building this business. So how have you built your business into a successful business? Jackie: Yeah, well it's been super [inaudible] [01:44] props that's how we've built our business. And just from the start it came together, and we knew that we had to work together. And so we decided… After we met, we mapped out a vision. And that included writing a book, and then we were going to start a speaking tour nine months later. Well fast forward, a month into knowing my business partner Justin, we ended up doing our very first talk. And from there now we've spoken in ten countries, and have taken hundreds of students through our online training, and taught thousands of people around the world this methodology that we created. But the way we did it was really not following the formula, and doing all of the things that people think that you need to do first. 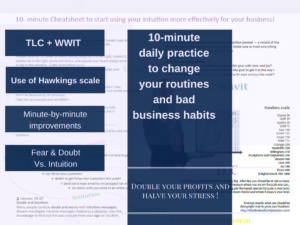 WWIT to start using your business intuition more openly?